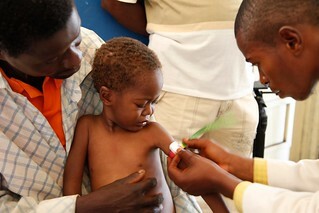 Medical staff measure the upper arm circumference of a child who may be malnourished, at the local hospital in Masi Manimba, DRC. The measurement is an indicator of the severity of the child's condition. Thanks to UK aid and the NGO Action Against Hunger, levels of acute and severe malnutrition have been reduced in this part of DRC, although there are still cases, and many families do remain at risk. Acute malnutrition is a major public health problem across the Democratic Republic of Congo. UK aid has supported the government of DRC and aid agencies including Action Against Hunger to provide emergency nutrition response programmes across DRC in 2010 and 2011. In some areas, the communities have taken the ideas that Action Against Hunger brought to them, and organised themselves to tackle malnutrition from the ground up - by forming their own co-operative farms and self-support groups. This image is posted under a Creative Commons - Attribution Licence, in accordance with the Open Government Licence. You are free to embed, download or otherwise re-use it, as long as you credit the source as Russell Watkins/Department for International Development'.